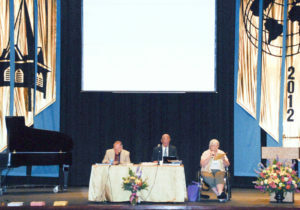 The mournful sound caused by the blowing of the shofar, the ram’s horn, called together Association of Free Lutheran Congregations (AFLC) conference attendees for the opening worship at Lincoln High School in Thief River Falls, Minnesota, on June 12. The AFLC was celebrating its 50th anniversary with the theme of “Jubilee,” and the shofar was reminding participants of the year of Jubilee, when all debts are forgiven. In addition to the praying, participants experienced a time of celebration for the 50 years of ministry of the AFLC. Several people in their 90s who had attended the first conference in 1962 were back again this time. The association accepted seven new congregations, including its first predominantly African-American church (from Louisiana). In addition, after AFLC President Elden Nelson announced he would not seek another term at next year’s gathering, the vice president’s race took on greater prominence. On the 10th ballot, Pastor Peter Franz, Grace Free Lutheran Church, Maple Grove, was elected.